Northeast State welcomed 54 new members into the College’s Alpha Iota Chi chapter of the Phi Theta Kappa International Honor Society for the 2015 Fall semester. The new members were inducted into Alpha Iota Chi during at a ceremony held Nov. 22 at the Wellmont Regional Center for the Performing Arts on the Blountville campus. The ceremony was led by the chapter’s student president Carly Sluder and student officers: Victoria Hewlett, vice president of Leadership; Anthony Walls; Myka Baker, vice president of Communication; Kyla Faust, vice president of Service; and Cassandra Ross, vice president of Scholarship; and Tessa Ross, secretary/treasurer-elect. New Alpha Iota Chi members lining up for induction. The newest members of Alpha Iota Chi are: William Allen, Mary Bouton, Matthew Boyd, Austin Bridges, Gloria Bridges, Stephanie Brooks, Michael Chase, Hailey Clark, Devan Click, Dorina Coggins, Brittany Cradic, Timothy Crowe, Whitney Culberson, Kimberly Daluisio, Samantha Deleon, Channing Deuling, Tyler Fields, Breanna Gann, Whitney Guinn, Tiffany Hall, Candace Hill, Ryan Hogan, Samantha Horne, Megan Hughes, Sommer Hughes, Jason Jackson, Marcus Jackson, Kelly Johnson, Kerri Jones, Kathy Letterman, Ali Memon, Tabitha Murr, Holly Norman, Christy Oler, Casey Osborne, Emma Perry, Jonathan Pollitte, Gregory Powers, Angela Ratliff, Shelly Ray, Christa Seeger, Tayla Sluss, Sarah Stewart, Aime Sturgill, Luke Swiney, Ashley Thacker, Austin Thaxton, Joanna Trent, Christopher Wallen, Megan Ward, Hannah Webb, Jessica Webb, and John Worley. Kyla Faust gives the Oath of membership. The award-winning Alpha Iota Chi chapter has achieved five-star status, the highest level of participation in Phi Theta Kappa activities. The society supports the four hallmarks of Scholarship, Leadership, Service, and Fellowship that are designed to give members opportunities for personal growth as well as service to others. Phi Theta Kappa is the largest honor society in American higher education with 1,200 chapters on two-year and community college campuses in all 50 of the United States and four countries. PTK lead advisor Jane Honeycutt and the chapter officers for this year. The Johnson City campus is going to an all-accelerated course format for the Spring 2016 semester. The format is designed to simplify course loads, schedules, and deadlines for any student who may benefit from an alternative to the traditional, 15-week, semester-long format. Accelerated courses are currently offered in three formats: Block 7, Web 4, and Hybrid 7. The formats may be mixed and matched as needed to develop a better work-life schedule. In this format, a student takes only two classes over a seven-week period. The classes meet for a longer period and/or more times per week (MWF instead of MW, for example). If the student enrolls for 12 credit hours or more, they meet full-time status and financial aid eligibility requirements. This format means fewer courses on which to concentrate; fewer assignments and deadlines to manage; and, in many cases, more time to schedule the rest of his/her life (work, family, recreation, etc.). These classes meet only from 8 a.m. to 5:30 p.m. In this format, a student is in class only one night per week for four weeks and the majority of instruction is accessed online. The class is demanding, but manageable because a student is working on just one class at a time. These classes are scheduled in the evenings from 5:30 p.m. to 9:30 p.m. The student may still enroll for 12 credit hours each semester to meet full-time status and financial aid eligibility requirements. In this format, a student may choose a blended format of about 50 percent in class and 50 percent online instruction. Generally, a student attends class twice a week from 6 p.m. to 9 p.m. over a seven-week period. A student may find this longer format better suited to his or her learning style and personal obligations. Again, the student may enroll for 12 credit hours and meet full-time status and financial aid eligibility requirements. In addition, a student has the option to mix and match all three formats to build a customized schedule of day and evening classes. This method fulfills Northeast State’s mission of Access, Completion, and Community like never before. 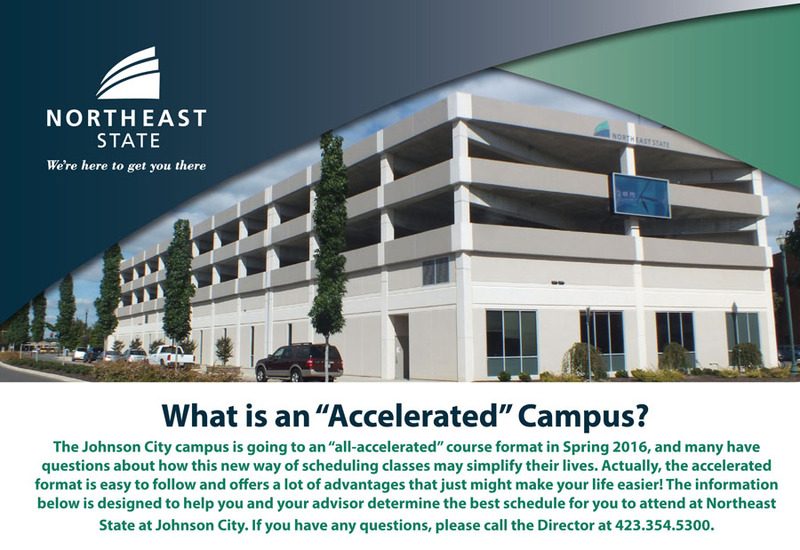 For more information on Johnson City’s accelerated formats, please visit www.NortheastState.edu/johnsoncity or call 423.354.5300. 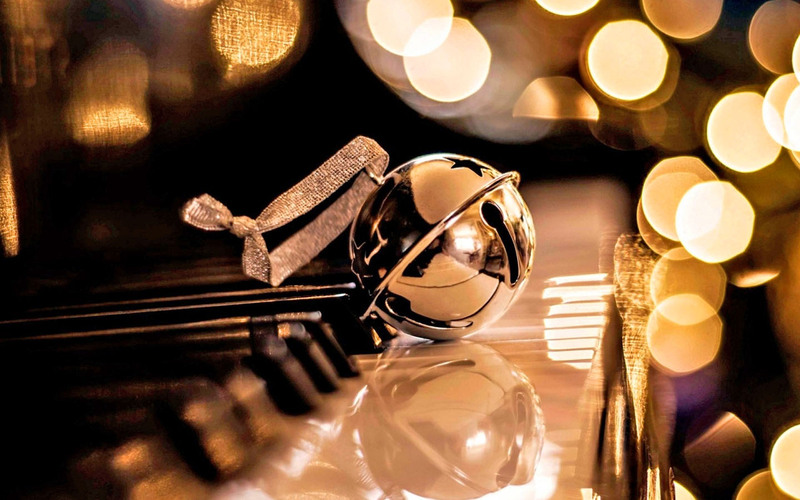 After decking the halls and stringing the tinsel, hop in the sleigh and come out to enjoy a Holiday Musical Concert at Northeast State. Presented by the College’s Department of Music, the show happens Thursday, Dec. 3, at 7:30 p.m. in the Wellmont Regional Center for Performing Arts at the Blountville campus, next to the Tri-Cities Airport. The concert is free and open to the public. The concert features performances by Martha Egan on flute, Margaret Swiney on solo handbell, and Northeast State student Jennifer Gryder on trumpet. The Northeast State Singers and Women’s Ensemble will also perform holiday classics and Christmas carols we all know and love. The concert will include both traditional and new selections such Albrecht’s The Christmas Rush! Beck’s Light the Lights, and Gilpin’s Skye Boat Song. Egan is a native of Kingsport and is an experienced flute, pennywhistle, and Irish Flute teacher. She is a frequent performer of Celtic, sacred, folk and classical music. She has been featured at the East Tennessee Celtic Society and played for the Celtic Society’s Festival in September. She will be playing The Holly and the Ivy and Come, Little Children. Swiney is a native of Bristol and is pianist for Sinking Springs United Methodist Church. In addition to her playing the piano and solo handbells, she plays solo desk bells, ukulele, bowed psaltery, dulcimer, one-string banjo, and thumb harp. She will be playing traditional favorites such as I Wander As I Wonder, the Huron Carol Twas in the Moon of Wintertime, Simple Gifts, and Be Still, My Soul. For more information, contact tcteague@northeaststate.edu or 423.354.5164. Current TN Promise students must complete 8 hours of community service by Dec. 1. The first shift on Nov. 14th is currently full. Volunteers are required to wear closed toe shoes for safety reasons. Volunteer profile forms are available on the website: www.netfoodbank.org. Students can contact Second Harvest at 423.279.0430 Ext. 225 to sign up or get more information. Other volunteer opportunities are available Monday – Friday 9:00 a.m. to noon and 1:00 p.m. – 3:30 p.m. The 2nd Tuesday and Thursday of each month from 5:00 p.m.-7:00 p.m. and the 3rd Saturday of each month from 9:00 a.m. – noon. 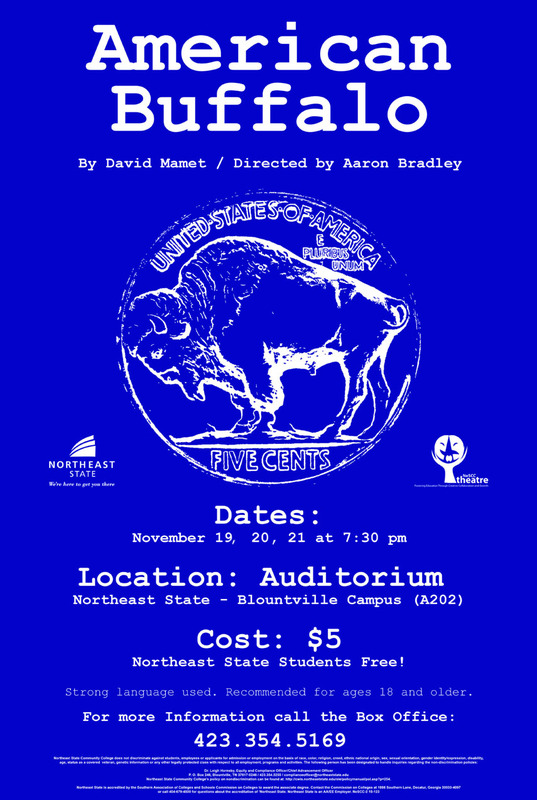 The Northeast State Department of Theater presents the award-winning, volatile stage drama American Buffalo for three nights only beginning Nov. 19 at the Blountville campus. Playwright David Mamet’s hard-hitting, profane tale delves into man’s ongoing struggle to rise above his lot, a goal which ultimately eludes most. 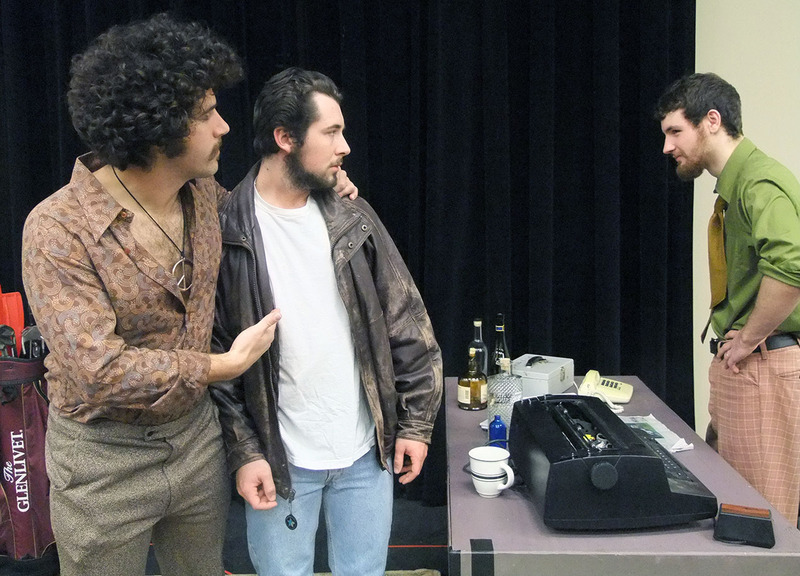 (From left) Teach (Charles Clark), Bobby (Dylan Jantz) and Don (Jonathan Proctor) plot their next move. The action centers inside a dusty Chicago junk shop where three small-time crooks plot the robbery of a coin collection including a prized “buffalo nickel.” While the thieves fancy themselves as businessmen, they must face the cold reality of violence and betrayal resulting from their choices. The play is presented by special arrangement with Samuel French, Inc. Tickets are $5 each and admission is free to Northeast State students with a valid student ID. The production dates are Nov. 19, 20, 21 at 7:30 p.m. in the Auditorium (A202) at the College’s Blountville campus. Due to adult situations and language, the play is recommended for ages 18 years and older. For more information, visit www.northeaststate.edu/theatre or contact Northeast State Theater at 423.354.2479 or e-mail emsloan@NortheastState.edu.